Writer/director Richard Linklater knows Texas as well as any of us (and as an actual Texan, I can vouch for the accuracy of down-home Texas style). In that sense, Bernie plays almost like the documentary it sometimes looks like (the interviews mixed in to the film lend it the air of a docudrama). However, for all the efforts it made to convince me that Bernie Tiede, the subject whose strange tale brought us here, was this nice, sweet, charming man, I got the sense that he was really a nutter at best, grotesque at worst. Bernie Tiede (Jack Black) arrives in the small East Texas town of Carthage. He is the assistant mortician, one with a gentle touch. He is the church choir director, he is loved by all the little old ladies, and no one in town has anything bad to say about him. They DO have a lot of bad things to say about Mrs. Marjorie Nugent (Shirley MacLaine), the wealthy widow and a real...witch. Her family hates her (and vice versa), everyone in town hates her (and vice versa). However, sweet little Bernie manages to whittle his way into the Widow Nugent's good graces. The exact nature of their relationship is never settled. It might have been a sugar mommy-type for services rendered, but also their are questions as to whether this effeminate, thin-voiced, musical theater-loving man who apparently never showed any romantic interests to any women was gay. Either that, or he had some sort of Granny Complex. In any case, Bernie and Marjorie started spending a great deal of time together, going on lavish trips, and spending a great deal of Marjorie's money, all the while Bernie taking over her finances and making many decisions. One day, however, Bernie shoots her in the back four times. Bernie looks very upset, but what to do. Well, for nine months Bernie fools everyone into thinking Marjorie is just not there, recovering from a series of small strokes, while he continues to shower the town with generous gifts. It is the persistence of her stockbroker Lloyd Hornbuckle (Richard Robichaux) that forces the police to go into her house where poor Marjorie is found in the freezer, under some meat and corn. Promptly arrested, only District Attorney Danny Buck Davidson (Matthew McConaughey) appears to think Bernie did anything wrong. The whole town so loves Bernie they don't think he should go to prison. It gets so bad in Carthage Davidson has to ask for a change of venue, not because the town is so prejudiced against him, but because it's so prejudiced FOR him. In another town (which the Carthaginians look down on as rather 'country'), Bernie is shockingly convicted of murder. Bernie tries to play all these acts up for laughs, but for a comedy I think I might have chuckled only twice. It might have been because A.) I thought it was trying to hard to be funny, and B.) minus the oddball Texas twist, I've seen and heard this story before (and I'm not referring to the Texas Monthly article Bernie is based on). Rich widow who falls under the spell of younger man of dubious character? Might as well have made a movie about Doris Duke. That was one issue I had with Bernie: minus the setting this story is a familiar one. I grant that Linklater (who adapted the article with its writer, Skip Hollandsworth) had a lot of local color (primarily from the interviews with real Carthaginians who appeared unaware that they were being made objects of ridicule). However, I kept wondering whether Bernie was being disingenuous by portraying the relationship entre Bernie et Marjorie as one where he 'adopted' this little old lady rather than perhaps one of cold-blooded calculation where Tiede's slow control over Nugent's finances was driven more by insidious manipulation than just something that occurred. Another issue is that Bernie was trying too hard to be whimsical and eccentric to match the subject matter. The interviews punctuate all the bizarre goings on, but the overall look of Bernie (including Black's full-on stage rendition of Seventy-Six Trombones) only serves to call attention to itself. 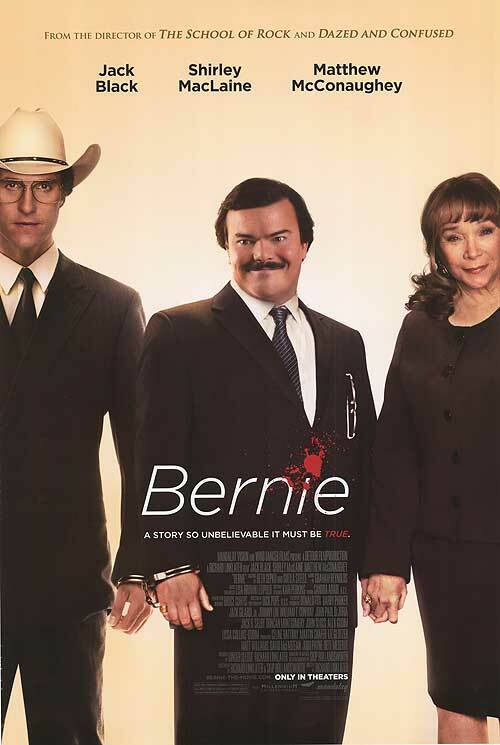 Despite all protests to the contrary, Jack Black's performance as Bernie Tiede never struck me as of a sweet-tempered, loving man who just got in too deep. If I had met Black's version of Bernie, my judgment would have been that the guy is a phony, a bit creepy, and a fake. I also would have thought something else but I'll use the euphemism 'a little light in the loafers' that my East Texan brethren use. In short, Black's Bernie was someone destined to be a hanger-on, and a remarkably false and reprehensible one. The fact that I would have run away from this Bernie says as much about my instincts as it does about Carthage's willful blindness. It's good to see McConaughey stretch to play a Texan, something we've never seen seen from him. Having said that, he did a good job as the only person apparently concerned that someone was shot in the back. It's when he's doing his 'interviews' that he reverts to making Danny Buck just another East Texas oddball. One delight in Bernie is MacLaine's crusty widow. It's a bit similar to her role in Steel Magnolias (minus the shooting) but in her scenes she shows the imperious yet curiously insecure woman. After watching Bernie, I saw there was a story here, albeit a familiar one. Minus MacLaine, I thought everything was too broad and pushing things into farce. Now, I figure that's what was being aimed at, but I think the story didn't need all the superfluous lunacy to enhance what could be a strange-but-true story.